I have for some time started to install the nice Quartz triggers on harness on a pair of Sonor 1007 drums. I started with the snare drum and the result together with my MegaDRUM-32 ARM based trigger device was great!! The dynamics became equal in feeling compared to a TD-30 set. I was extremely impressed by how much a proper mechanical implementation made for the trigger solution. (It feels that I have been chasing right settings on my MegaDRUM forever, first using the Roland RT-10S triggers and then also built my own crossbar with triggers from 682DRUMS. I must admit – the drum feeling was not 100% right before moving to the Quartz stuff. When installed – everything started to operate as I wanted it! I had some rules before starting up the project. • No drilling in the Sonor 1007. • The current ventilation holes was too small to fit the female connector…so you needed to drill to fit the connector. • I wanted to remain/keep the drum bottom heads on the drums for visible/ethic reasons. Looks great on! • Mounting the female connector outside the drum could have been a solution, just using the trigger cables through the vent hole…but that would not resulted in the right look. After studying some solutions…I came up with my own solution. Very often drummers do a mic/vent hole in their bass drum using an old can which have been heated up and then used to melting a drum head hole. I also saw some solutions like the XM Elec Drum, who actually have mounted the triggers and the connector directly on the mesh head. So I thought why not mount the female connector on the bottom drum head. 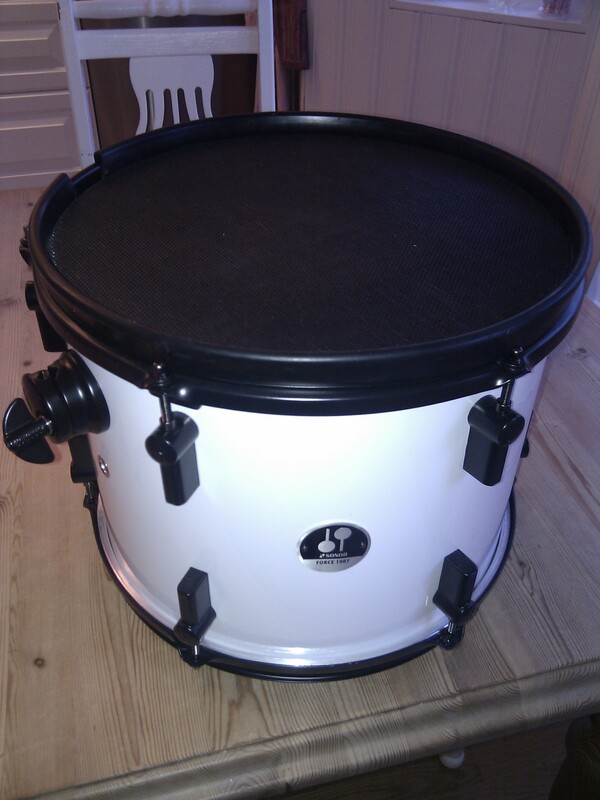 Easy to replace a bottom drum head, if going back to play analogue drums again. • So, I took two big washers with 12-13 mm inner diameter – just enough to fit the female connector. Painted them in silver color. • Took a marker pen and draw a line inside the washer on the bottom drum head. 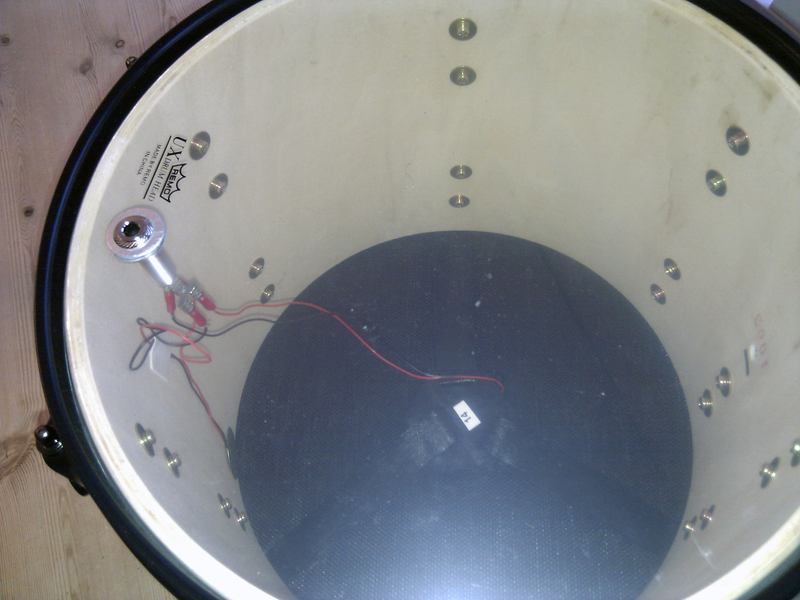 • Used a solder station to burn a hole on the drum head inside the line. 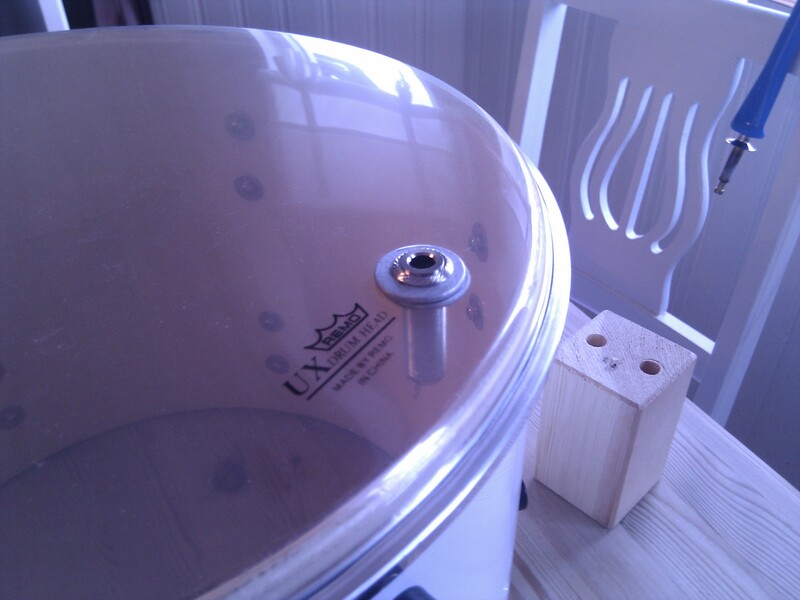 • Mounted the female connector using the one washer on each side of the drum head. • Tighten the nut for the female connector – quite hard. • Installed the Quartz triggers and connected the wires to the female connector. Finally, the solution seems to be working fine. The connected teleplug sits tight connected and there seems to be no risk that it should be falling out. Before. With the centrally mounted Quartz triggers you are able to obtain functions like positional sensing with MD.